Karl Wheeler lost his Southern Area title challenge. Down but not out. That’s the message coming from Karl Wheeler today (March 20) after suffering Southern Area title defeat 48 hours ago. The 34 year-old city cruiserweight was stopped in the fifth round by Wadi Camacho from Ilford as they battled it out at York Hall, Bethnal Green, for the vacant Southern Area crown. He said on social media: “I’ve been speaking to a lot of people and some are saying I should leave boxing alone and concentrate on my new business venture of running a gym. “Yes, I’m 34 years old but I’m a young 34 and I still believe I will one day win a Southern Area title. So am I going to quit boxing? No way. Wheeler’s trainer Steve Whitwell was quick to praise his fighter for showing great courage against Camacho but was critical of the tactics he employed. He said: “Karl gave a great, great show of guts but spent too much time on the ropes giving Camacho the opportunity to land his big combinations. Camacho, who was hungry to retain the belt he lost in his last fight in September, boxed a smart fight from the opening bell. 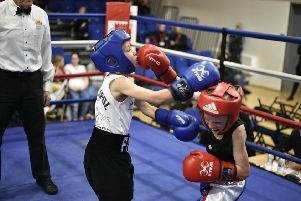 He didn’t get involved in too much on the inside and used his long jab to very good effect to win the first two rounds. Wheeler had more success in the third and there were some great exchanges between the two which had the crowd on their feet. In the fourth round, Wheeler tried to lure Camacho into a brawl but it didn’t work. All it did was allow Camacho to unload big shots especially to the body and Wheeler was fortunate to make it to the end of the round. Camacho maintained the pressure in the fifth and landed a massive combination of four body shots followed by a hook to the head. Wheeler was stunned and went down on one knee. He was up at six but the referee had seen enough and waved it off. Whitwell added: “To be honest he could have continued but the stoppage was coming anyway. Karl could have been seriously hurt so it was probably the right decision. “It is a bit of setback for Karl but he showed a lot of grit and determination. He will learn from this and be back some time later in the year.